Basmati rice cooked with vegetables and flavored with spices. Heat 4 tbsp vegetable oil in a medium sized pan. Add cinnamon stick, bay leaves, cardamoms, cumin seeds, & cloves. Add onions and continue cooking till the onions appears slightly golden brown. Add ginger garlic paste, green chili paste, and grated tomatoes. Stir for two minutes. Add seasoning i.e. salt, red chili powder, & turmeric. Stir together for about 5 minutes on low to medium heat. Add the chopped vegetables, cashews, & raisins to the above mixture. Allow the vegetables to cook covered for about 5 minutes on low heat. Add washed rice & carefully mix it with the vegetables. Add 1 cup water and 1 tsp lemon juice; cook covered on low heat for another 15 to 20 minutes. Check to make sure the rice is cooked. Then close the burner and let it stand in the pan covered for about 5 minutes, this will help the steam in the pan to settle in the pulao. In a deep pan, heat oil for frying. Peel the potato and cut into medium sized chips to fry and keep aside for garnishing on pulao. 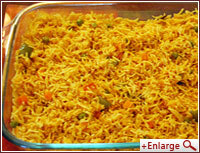 Serve the pulao on a platter dish and garnish with finely chopped coriander leaves and potato chips. 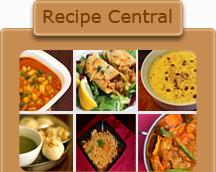 Enjoy with curd raita or by itself.